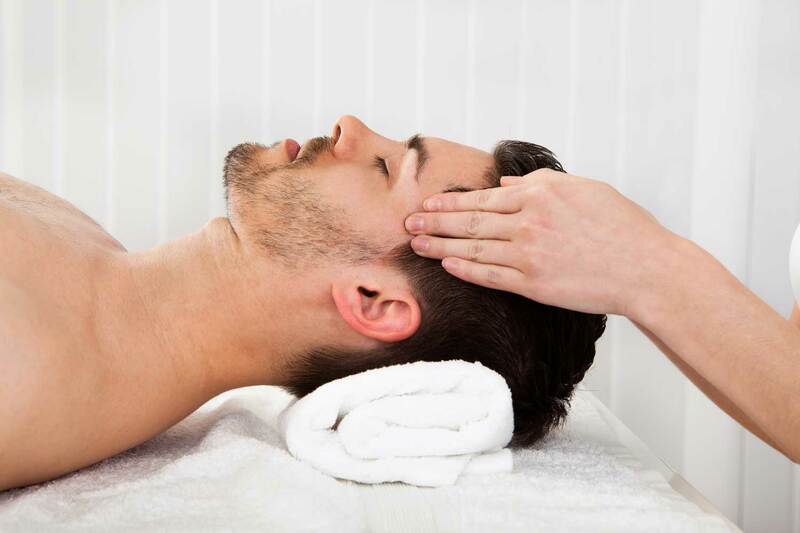 Indian Head Massage focuses on stretching and relaxing facial, neck, cranial and shoulder muscles, easing the daily aches and pains caused by stress, whilst the mind gently drifts into a relaxed state. Not only does it promote strong, healthy and shiny hair, it also stimulates the body’s natural powers to heal itself. Indian Head Massage has been practised for thousands of years by the women of India and Indian barbers. However, in England therapists offer a more westernised form of Indian Head Massage in order to concentrate the treatment on specific areas of stress; such as the neck, shoulders, upper back, upper arms, face and head. A longer treatment of 45 minutes also includes the hands and lower arms. You either lie down or sit in a chair; this is the patient’s choice. You remove your outer layer of clothing, such as jumpers/cardigans and then you are wrapped in a towel, so massage oils can be used without staining your clothes. Your therapist works on the upper back, shoulders, neck, scalp and face using a variety of movements (both relaxing and invigorating) to relieve accumulated tension, stimulate circulation and restore joint mobility. All treatments can have a combination of pure essential oils added at no extra charge. What can Indian Head Massage help treat? Having been going to Chantal for a while before my pregnancy it felt natural to continue whilst my body changed to grow my beautiful daughter. Chantal was excellent at all the stages through my pregnancy and even explained that I could still have treatment even in my final days of being pregnant. When getting treated she understood every slight problem I had and even my existing ones pre pregnancy. She treated my differing symptoms each time which was a great relief for myself and my body. She was a great help to keep my body functioning well even in times of pain throughout my pregnancy. I would totally recommend anyone to get treated while pregnant and would highly recommend Chantal being the one to do it. Thank you Chantal.